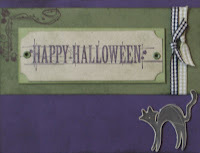 I finally got to sit down and play with one of my new Halloween stamp sets. This one is Autumn Apparitions from the Holiday mini catalog (click the catalog link in the sidebar and it will take you to both catalogs). I found my colors using the Color Combo. I knew I wanted to start with Elegant Eggplant so used the Color Combo to find colors to mix with it. I really like how this turned out. I sponged all the cardstock pieces with it's corresponding ink color and then ran the edges along the ink pad to define them more. I can't wait to get started on the rest of my Halloween stamps!! Supplies (all from SU! ): Stamp set (Autumn Apparitions); cardstock (Elegant Eggplant, Always Artichoke, Mellow Moss, Sahara Sand); ink (Basic Black Classic, Jet Black Staz-On, Elegant Eggplant, Always Artichoke, Mellow Moss, Sahara Sand); Always Artichoke eyelets; black gingham ribbon; moss gingham ribbon; sponges; and Stampin' Dimensionals.